Ferment, a sign of progress in any scientific field, has previously been lacking in the area of cryptorchidism, where the only activity has been in improving operative methods. Now, however, profound changes in the care of boys with cryptorchidism are being brought about; ideas are arising from a fresh look at comparative anatomy, and histological and experimental observa- tions are being supplemented by clinical tests made possible by new hormonal agents. The treatment of cryptorchidism begins with its recognition by the pediatri- cian, who until now has shown little interest because of disappointing results from chorionic gonadotropin administration. As for the surgeon, his bent toward restoration of normal anatomical relationships has kept his attention focused on the development of better surgical technics to bring the recalci- trant testis into the scrotum. Both specialists have avoided the primordial question of why the testis did not descend properly. If this were known they would treat the cause of cryptorchidism, and not be satisfied merely with trying to correct its end result. 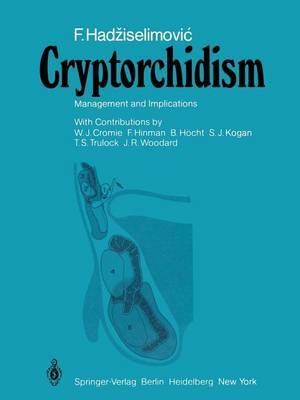 As one reads this book, one sees that in most patients cryptorchidism is not caused by some anatomical structure blocking the way or by some deformity of the testis interfering with the transport mechanism. Rather, deficiencies in the hormonal environment of the fetus retard the developmen- tal sequences essential to the normal differentiation and descent of the testis. The clinical solution is thus to provide the deficient substances.